15777706 Features: -30 Foot length (most popular length), 3 way electric switch on handle (you can turn off vacuum or power nozzle with a flick of your finger), ETL safety certificate and double reinforced hose so it will last for years to come. 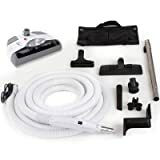 -Comes with a high end carpet power nozzle, 30 foot hose with 3 way switch, deluxe tool kit and 2 year factory warranty!. -Fits all central vacuum cleaners brands like Beam, Electronics, Canvas and more. Dimensions: Overall Height - Top to Bottom: -52". Overall Width - Side to Side: -14". Overall Depth - Front to Back: -11". Overall Product Weight: -6.1 lbs.